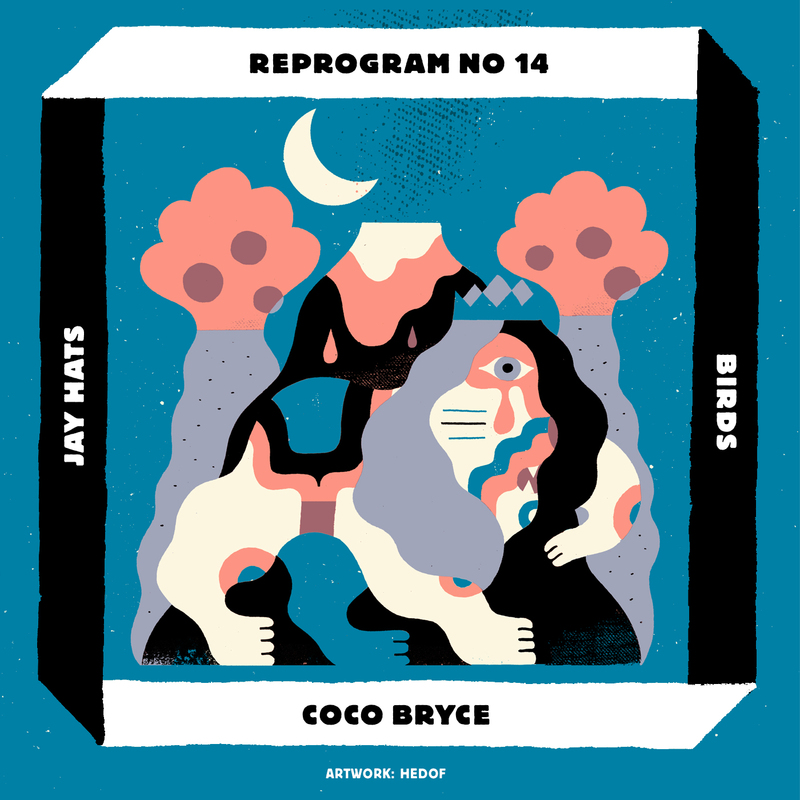 We present the fourteenth track release of the remix-artwork project ‘REPROGRAM: A SEQUENCE OF REMIXES’: Coco Bryce remixed ‘Birds‘ by Jay Hats and Hedof provided the artwork. ‘Birds‘ is the title track of this year’s released debut single by Eindhoven-based electronic musician Jay Hats. With the delivery of his firstborn, Hats – known for exceeding musical borders – pulled the listener in to his jungle of dub, nu-soul, jazz, house and hypnotic percussive grooves. Make sure you also download the remix by Jay Hats for Coco Bryce (REPROGRAM #9)! Coco Bryce is up to bat to throw in his remixing skills for Reprogram #14. Coco is a producer/DJ, label-owner (Myor) and musical omnivore. He’s known for his productions & DJ-sets full of eclectic hiphop beats, rave, trap, skweee and wutnot. He collaborated with with artists like Kelpe, Slugabed, Pixelord and Krampfhaftand released music on Harmönia, Saturate!, Black Hole, Mässy, Astro:Dynamics, Car Crash Set & others. In 2013 his released ‘Club Tropicana‘, his second album on Fremdtunes. Hedof made the artwork for Coco’s remix. Hedof is Rick Berkelmans (1986). His work consists of a vibrant mix of images, typography and color. Never being too much in your face, Berkelmans always makes sure his work is packed with a certain attitude, casual but clever, tactile but professional. The finishing touch to his work is Rick’s love for printing techniques, which combines his fresh illustrations with a unique vintage look. Rick lives and works in Breda where he runs his oneman design studio Hedof. With a combination of commercial projects and exhibitions he raised his profile on an international level.